The beginning of Indian Railways goes back to the first track laid between Bombay and Thane in the middle of the 1800s. Over the next hundred plus years, the railways developed into a massively networked system covering over 60,000 kilometers, about 8,000 stations and over 100,000 kilometers of track including broad and narrow gauges, and metro lines. As once estimated, Indian Railways carries over 11 million passengers daily and over a million ton of daily freight. Add repair workshops, production units, services, safety, engineering, and everything else keeping you from losing out on your precious vacation, and you will get one of the world’s largest employers. Employing well over a million, one cannot help but feel sorry for the party-planner who has to organize team building events, if they had any. 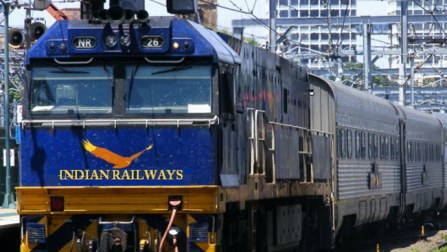 Indian Railways is essentially a government department with commercial services. Being a public-sector job, it attracts a lot of attention for its stability in employment – from among candidates who have no college degrees, for smaller roles, to candidates who have to crack some of the most prestigious examinations in the country to be hired into its higher up positions. In this article, we will talk about railway jobs – its structure, the pros and cons, how the recruitment works, what is expected from candidates to be able to qualify, and where can you find more information about their recruitment drives. Owing to its considerable massivity, the organizational structure of the Indian Railways has been divided into 17 zones, ie. Central Railway, Northern Railway, South Eastern Railway, and such, for ease of administration and thereby recruitment. Each zone is headed by a General Manager (GM), reporting to the Railway Board, which in turn is supervised by the Ministry of Railways. Every zone has 10 Functional Branches, or departments, that take care of the major functional categories of the railways – its personnel, maintenance, safety, traffic, telecommunication, etc. There are also 6 Production Units, Central Organization for Railway Electrification Allahabad, the Research Design and Standards Organization (RDSO Lucknow), Railway Staff College, workshops, and other public-sector undertakings like the IRCTC, that are also part of the Indian Railways organizational umbrella. As one can imagine, railway employees can range from non-specialized, or non-technical, positions like helpers, porters, to highly administrative, or specialized engineering, roles as officers in one of the functional areas of the railway system. The recruitment process, therefore, is divided into personnel selection responsibilities between the Railway Recruitment Board (RRB) that is responsible for hiring the lower grade staff (also known as Class III or IV) and the Union Public Service Commission (UPSC), which conducts exams to control the hiring into the higher grades (Class I). Railway staff thus fall into four distinct groups, from A to D, A being the highest-grade officers and D the lowest staff members. Read How to get a Government Job after graduation? Being in the public-sector, railway jobs come with perks and benefits that are usually not available to someone in the realm of the private-sector (Read Differences between Government and Private Sector Jobs). But even with the many boons, there are certain disadvantages that may eventually cause work heartaches if you decide to join the railway workforce without weighing in its pros and cons. The table below shares some of the known advantages and disadvantages of railway jobs. The Grade A officer positions are quite competitive and extremely prestigious. They are “Gazette” officers with considerable administrative powers. Salaries, especially after the 6th and 7th pay commissions, are quite competitive. There is also a lot more opportunity for building your savings, given the tax-free housing allowances and other remunerative benefits. Athletes can use the Sports Quota to gain entry into the Indian Railways, otherwise not available in private firms. Chances of job growth is not as directly related to merit as it is in the private-sector. Often senior employees, without deserving credibility, get promoted before the more deserving newer employees. Being a transferrable job, family stability is often disrupted keeping spouses from having a stable constant job in one place. Children too have to shuttle between transferred locations, adding to the stress of frequent uprooting. Bureaucracy is rampant. Simple tasks may take months to approve leading to repeated hindrance to work progress. The nature of Railway jobs can be demanding on your routine. “Work Shifts” are not conventional, often invading personal family space. As mentioned before, railway jobs are classified into classes – Group A, B, C, and D. In the following sections, we will cover, in brief detail, examples of designations within each Group, their eligibility, age limit for job application, education requirement, and salary. The highest grade you can be recruited into is the Group A (Gazetted Officers), selected into one of the 10 departments/functional branches of each of the railway zones. They comprise the non-technical, technical and medical, services. The table below shows the various departments, and what comprises the Grade A recruitment process into each of the functional branches. Undergrad from Central, State, Deemed University. Age limit is between 21 and 32 years, with age relaxation for OBC/SC/ST candidates Age limit is between 21 and 30 years, with age relaxation for OBC/SC/ST candidates Age less than 32 years, with age relaxation for OBC/SC/ST. Papers 6-7: Written test on subject of choice. Personality Test Stage 1: General Studies and Aptitude Test. Engineering discipline specific paper. All candidates are required to be an Indian Citizen, Nepal Citizen, Bhutan subject or a person of Indian origin, migrated from Pakistan, Myanmar, Sri Lanka, Kenya, Uganda, Tanzania, Zambia, Malawi, Zaire, Ethiopia or Vietnam, with the intention of settling in India. Railway Job (Group A) Notification: It is recommended that you follow the UPSC Calendar for exam dates each year. Vacancies and exam dates also appear in all the national dailies and the Indian Railways website. Group A Railway Job Average Salary: A Class 1 (Group A) officer can have salaries of about INR 80,000 to 90,000, plus perks such as HRA, medical, transport, etc. Group B officers are not recruited through direct means. The system relies on promotion from candidates already in Group C posts. In the Civil Engineering department, for instance, 70% of the posts are filled by a selection process – written test and interview – of the non-ministerial Group C staff of the same department. 30% posts are accommodated by Group C staff who have qualified a departmental competitive exam after serving a minimum of 5 years in the same grade (Source). Group C employees can be gazetted or non-gazetted (if they don’t hold any administrative role). Group B Railway Job Average Salary: Salaries can be about INR 50,000 plus perks. A Railway Service Commission, established in 1942 to facilitate personnel selection, was later renamed as the Railway Recruitment Board (RRB), in 1985. Currently, there are 21 RRBs, responsible for technical and non-technical recruitments to the various zones, production units, RRB NTPC, and other areas of the Indian Railways. The following table lists some of the technical and non-technical posts under the Group C, their eligibility requirements, tests, age limits, and salaries. Group C Railway Job eg. Ticket Collector Written Exam on General Awareness, Arithmetic, Technical Ability, Reasoning, Aptitude, General Intelligence. Assistant Station Master (ASM) Preliminary Exam. Written Exam on General Awareness, Arithmetic, General Intelligence, General Science. Assistant Locomotive Pilot (ALP) & Technician Grade 3 Written Exam on General Awareness, Arithmetic, Technical Ability, Reasoning, Aptitude, General Intelligence, General Science, Technical Ability. Goods Guard Written Exam on General Awareness, Arithmetic, Technical Ability, Reasoning, Aptitude, General Intelligence. Para-Medical posts, Civil, Mechanical, Electrical, Signal and Telecommunication Engineers, Commercial Apprentice, Traffic Apprentice, Senior Time Keeper, and countless more also belong to the Group C cadre of railway jobs. Candidates associated with posts requiring safety standards like the Assistant Station Master, Traffic Assistant, or Assistant Loco Pilot, are required to qualify an online aptitude test. Railway Job (Group C) Application and Notification: Candidates are required to pay a nominal fee and fill online applications to be called for testing. Qualifying the test doesn’t lead to automatic assignment. Duties are appointed based on zonal requirements. Vacancies are advertised on the Indian Railways RRB websites, of each of the 21 RRBs, as well as in all national newspapers. Group D consists of posts like Trackman, Gateman, Helpers, Porter, etc. They are required to be between the ages 18 to 31/33 years (with age relaxation for OBC/SC/ST) and have Indian citizenship. Education qualifications require a minimum of passing the 10th standard or an Industrial Training Institute (ITI) certificate from either the National Council for Vocational Training or the State Council for Vocational Training. The application format is online and candidates, depending on the post, are required to qualify a CBT, a Physical Efficiency Test (PET) and Document Verification. The selection is conducted at the divisional or zonal levels, supervised by the RRBs. Railway Job (Group D) Application and Notification: Vacancies are advertised on the Indian Railways RRB websites, of each of the 21 RRBs, as well as in all national newspapers. As you can very well guess, the process is tedious and requires rigorous screening of over a million candidates to fill positions at the various grades. These vacancies are not floating and only announced every few years. Just keep a lookout for the next advertisement (for instance RRB Chandigarh Employment Notices available here) and make sure you don’t fall for crooks promising an entry for a price. Note: If you are hooked and ready to hop on the train to a railway job, here is a quick update. The 2018 Indian Railways recruitment drive is looking at hiring over 90k posts in Group C and D categories. The application deadlines are in the first week of March 2018 and candidates everywhere are scrambling to get their names into the system. Every category serves up its vacancies as mentioned within the article. Refer to the details above. The application links or means are accompanied in the job ads. That bit is covered in the article. You will have to keep a regular check on national and employment newspapers, as well as the Railway and UPSC websites.